Valio is the leading dairy product manufacturer in Finland, and the Haapavesi plant processes and packs one of Scandinavia’s favourite cheese brands Oltermanni. Inside this factory there are two automated guided vehicles by Rocla working 24/7. Rocla has been developing and manufacturing AGVs for 35 years. These AGVs have been customised with the Oltermanni branding and have quickly become part of the team. Before same pallet transfers were handled by man-operated trucks. The premises are confined and distances are not that long. The work itself caused stress to employees and a challenge in work safety. At Valio they wondered, why should a good employee be doing this kind of boring work phase. Valio wanted to find a new solution to this. Pallets are being loaded with products in only a few minutes intervals. In order to keep the production line running smoothly the full pallets need to be transported right away to the shipment. In the old days the drivers needed to be ready all the time to move the full pallets to the shipment preparation. By replacing manual operators the amount of damage to vehicles, stock and site has reduced by 90 %. The number of forklift operators Valio employs on this site has fallen from 8 to 4 and manual shifts have fallen from 3 to 2. These AGVs can run unattended through the night with a traceability of 100 %. Crucially these machines don’t require track installation or wholesale changes to the existing design of a warehouse. 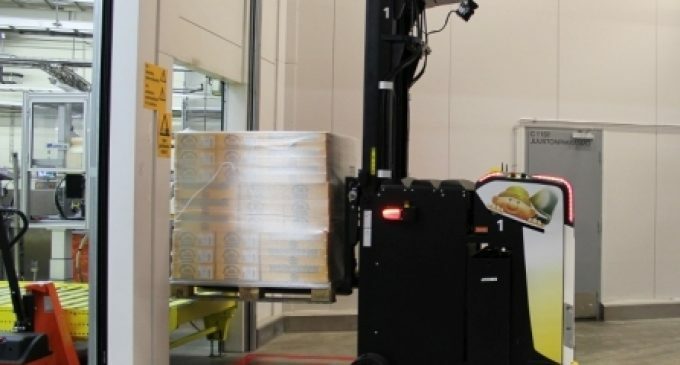 The AGVs know their jobs and get on with them and when they are running low on power, they automatically roll themselves onto floor-mounted charging contacts. The AGV receives its instructions by wifi and carries them out using a rotating laser which bounces off a series of discreetly placed reflective strips. The unit can calibrate its exact position to within a centimeter. And it’s safe too. Sensors at both ends, in the side rails, above the AGV and in the forks themselves means that if anything comes too close it stops. 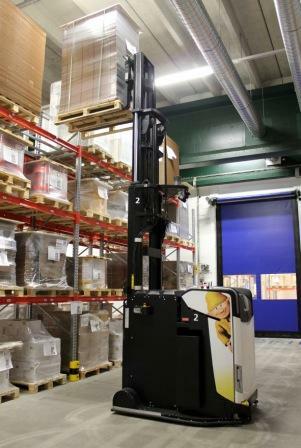 The AGVs are moving around in areas where there are also manual forklifts and people, and they get along with everybody. “People are often afraid of new things but nowadays everybody says they wouldn’t give them away,” concludes Marko Palosaari, Valio Haapavesi Plant Manager.